Port Townsend Wooden Boat Festival 2016 Taleisin - Adventure Machine! 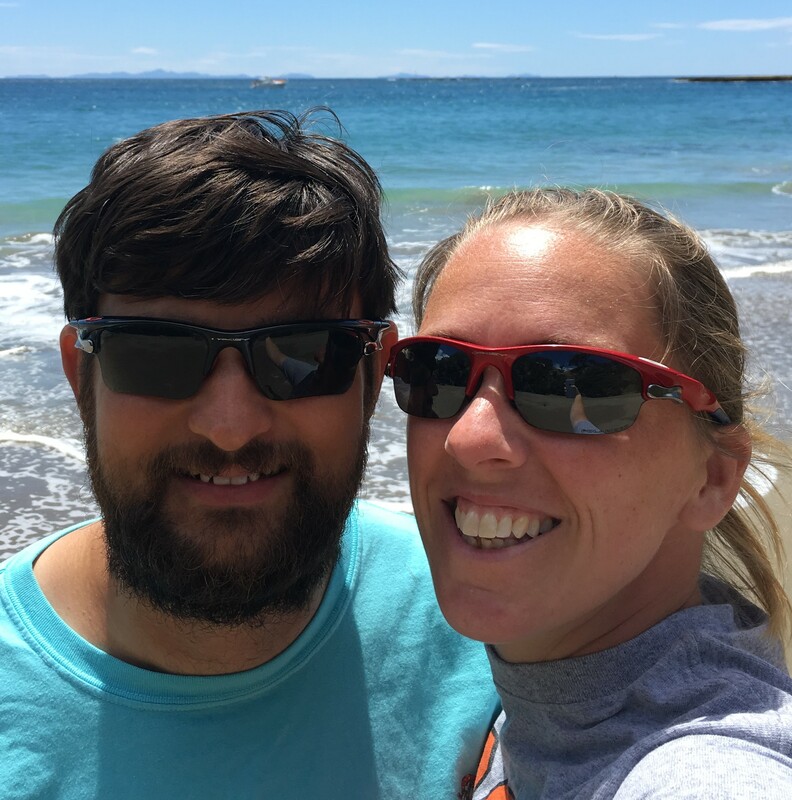 Our recent status as wooden boat owners has opened up many new doors to interested and exciting opportunities. We are not only new to wooden boats but to boats and sailing itself. One evening after completing one of many boat tasks I gave Lin Pardey a call to share my experiences. 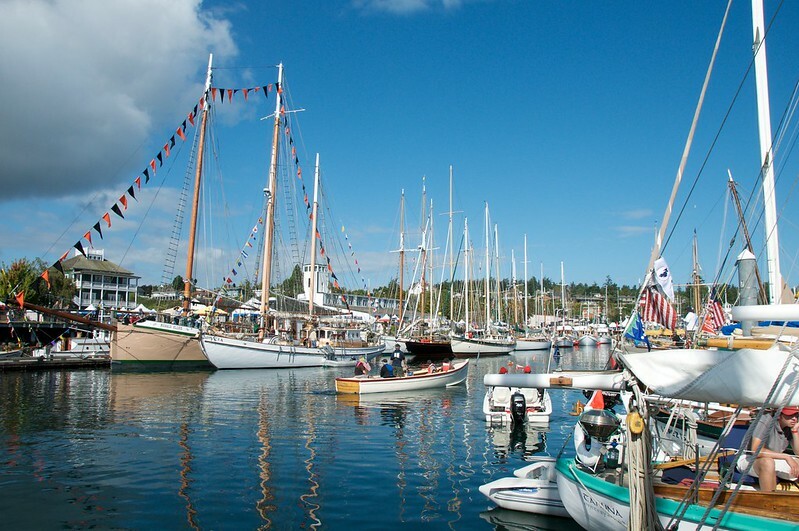 Lin suggested that we come along to the wooden boat festival in Port Townsend Washington State, USA. This presented numerous challenges concerning work for both Annie and myself. When I got home that evening I told Annie about this random spur of the moment idea and we decided that life is too short, screw it - lets do it! I distinctly remember Annie asking, “What will I be doing for three whole days”? Eventually we made our way into Port Townsend late in the afternoon. We walked from the bus stop to our accommodation. Everybody in town was very friendly, the homeless people sleeping in the park were greeting us as we walked past. The feel of the town was worlds apart from the busy city. Port Townsend truly is the hidden gem of the pacific north west. Our hosts drove us into town that evening for dinner. It’s worth noting that we have never met them before. They were kind enough to put us up for the duration of the festival at no charge. It’s important to note that if you’re planning on attending the festival that accommodation books out a year in advance, plan well ahead and book very early. After dinner I had to use a bit of slight of hand so that I could actually pay the bill, our hosts were being too kind to us. This was only the start of a very warm reception in this wonderful town. The next morning our hosts sent me a text message to inform me that they have left us passes for the festival which will get us in, free of charge. This is generally not the sort of thing we’re used to. We stayed close enough to the festival grounds so that we could walk. We set off early in the morning and there was a bit of a chill in the air. By the time we reached the festival it was nice and warm. The festival is held in the marina on the edge of town. There are over 300 boats packed in like sardines. The harbour master did a fantastic job. 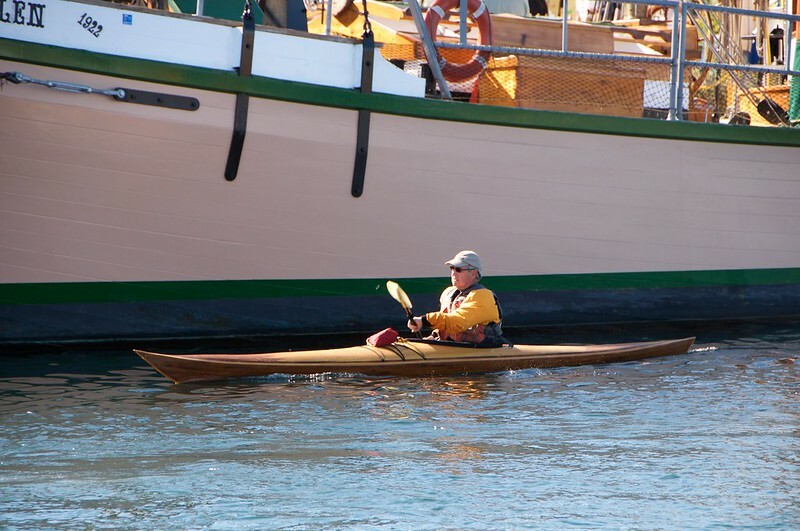 The boats ranged from large steamers and schooners to small row boats, beautiful stand up paddle boards and kayaks. If there was a way to build it out of wood and it floated you could find it there. This might sound strange but there were so many beautiful boats that it all got lost in the abundance. It was really hard to appreciate each individual boat with so many around it. The docks were filled with enthusiasts of all ages. It didn’t take long before we were invited to board vessels, with proud owners showing off their baby. We could spend hours talking to one owner and looking at just one boat. Unfortunately we only had 3 days to see as many of the 300 odd boats as we could. With so many boats around, and so many Kiwi’s, there was bound to be a Kiwi boat. 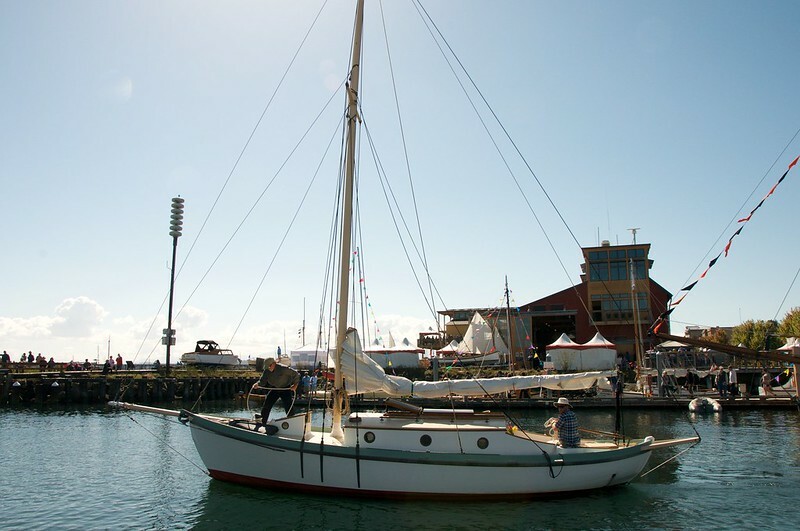 Heather is a 37 footer built in Auckland in 1937. 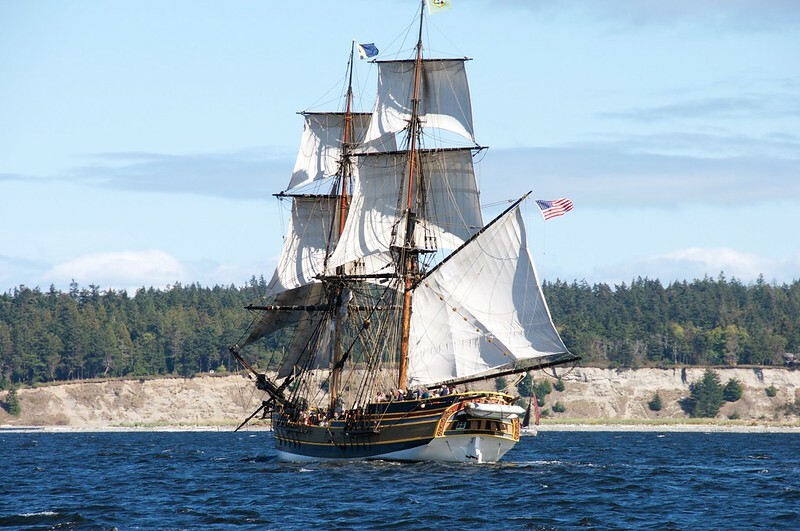 She completed a solo circumnavigation in the mid 60’s and sailed to Hawaii in the 70’s, now she resides in Port Townsend. It was great to see a little bit of home. Given the amount of boats it became quite clear that 3 days would not be enough, to add to the challenge there were multiple seminars being presented simultaneously throughout the entire festival. It was impossible to choose which seminars to attend and which to skip. They were all very well presented and full of incredibly useful information. If you were that way inclined you could get 3 days worth of value out of just attending seminars. While all of this is taking place there’s a bunch of teams building wooden boats for the competition that is held over the three days. We were so busy that we never got to see the final results. We managed to have one walk by to inspect the progress on the first day. We spent some time in the seminars, all the seminars we attended were well presented and has something of value in them. Our hosts put on a fantastic BBQ for some of us Kiwis, we spent the whole night having a great time with all the new friends we made. While at the BBQ it was suggested that we try to get onboard for the schooner racing. We spent the next morning trying to find a boat to crew on. We were not successful, barefoot Bob to the rescue! We met Bob at the BBQ our hosts put on for the Kiwis, he’s a very colourful character with a great sense of humour. Bob found us a spot onboard Sassafrass, the owners were very friendly and we had a blast. There’s nothing quite like experiencing these wonderful boats out on the water under full sail! This took up the entire afternoon, while it cost us valuable time we could have used looking at boats at the docks. This experience was well worth the cost! If that was not enough, the town is littered with antique shops and second hand bookshops. This is another favourite of ours, we only managed 2 bookshops and one antique shop, it was huge, the biggest antique shop we’ve ever been in. This alone made us wish we had 3 weeks to spend in this wonderful town. To top the experience off there were all kinds of toys and eye candy for boats. Almost anything imaginable for wooden boats. The foundry had a display of the wonderful goodies they can make for your boat. Authors selling their books, tools, tools and more tools. 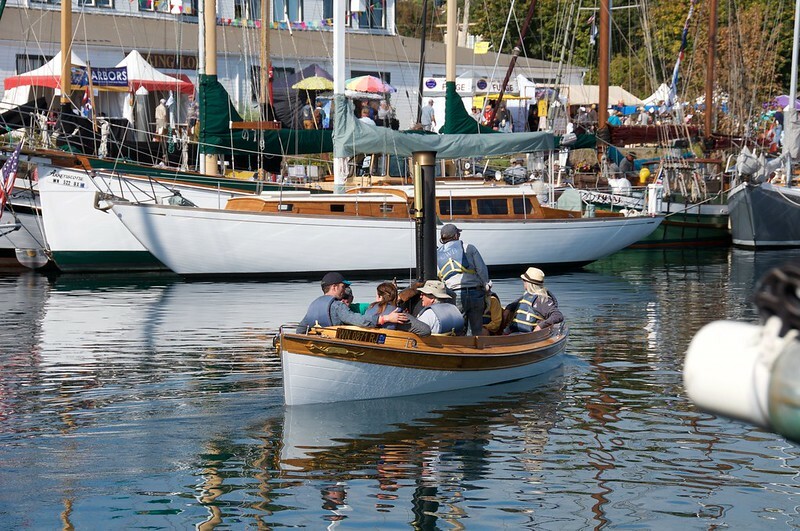 If you’re a lover of wooden boats, this is certainly the place to be. I recommend you come for the festival, but stay for the town and it’s wonderful people! I mentioned earlier that there’s only 2 buses in and out of Port Townsend. This left us with a bit of a dilemma. Since I didn’t do my homework and booked flights out of SeaTac for 9am on Monday, this meant we would have to leave the festival at 4pm on Sunday to catch the bus at 5pm back to Seattle and spend the night at the airport. When I started to ask around if there was anybody leaving super early on Monday morning so we could catch the 6am ferry (2 hours drive), barefoot Bob came to our rescue. Bob is a Port Townsend local, he’s got a heart of gold. He asked around, since he was working with the harbour master he was talking to lots of people. He came up empty handed, but in the most unexpected bit of kindness he offered to drive us to the ferry at 4am himself. This illustrates just how kind the people in this little town are. Bob made an off the cuff comment that this is what they do in Port Townsend. I believe him, everybody was awesome! Suffice to say we made the journey on Monday morning and caught our plane to Boston without any drama. A special thanks to barefoot Bob, Brion and Christian for making our stay in Port Townsend very special and something we’ll remember for the rest of our lives. If you ever find yourself in Port Townsend, find barefoot Bob! Buy him lunch, dinner or a beer. This will give you an excuse to meet him, he is awesome!